British artist Dora M. Batty (1900–1966) worked in advertising, ceramic design, and textile design—from 1932 to 1958 she taught textiles and then headed the textile department at London’s Central School of Art—but she is perhaps best known for her graphic illustrations. She designed more posters for London Transport and the Underground than any other female artist. 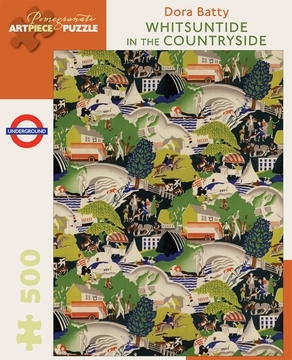 Her striking artworks encouraged the public to celebrate holidays such as Whitsun by taking outings to London’s surrounding countryside.Whitsuntide is from the collection of the London Transport Museum, one of the finest poster archives in the world.